Factory-built mid-size pickup trucks capable of gonzo levels of off-road running are a relatively new phenomenon, with Chevy wading into the fray with its Colorado ZR2 and Jeep introducing its Rubicon Gladiator earlier this year. 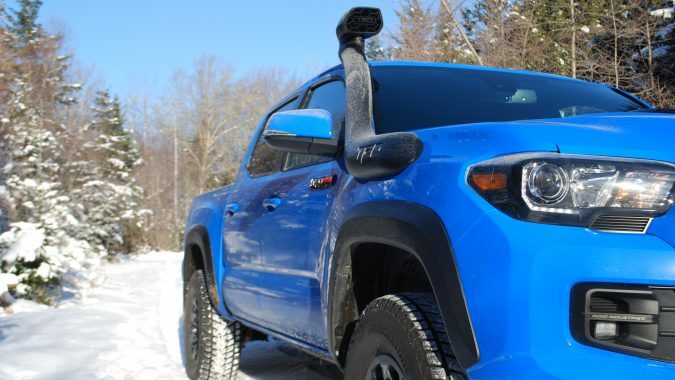 Toyota has had a TRD Pro version of the Tacoma in its toolbox for a while but has recently decided to shovel some R&D dollars into the suspension of this athletic truck in an attempt to keep up with the Detroit Dune Busters. For 2019, Toyota has swapped out Bilstein shocks in favour of a set from Fox. If that supplier sounds familiar, it’s because they also provide suspenders for the mighty Raptor. These expensive off-road dampers are paired with new TRD springs that provide an extra inch of height, designed to supply a cushy ride over the normal bumps and frost heaves one will find on their daily commute but ramp up their performance when stretched to their limit. Fox achieves this by installing bypass channels in the shocks (eight in the front pair, eleven astern) that vary the damping rate. This allows the fluid inside to travel different paths based on demand. Take a dune jump at speed and the 45mm shock piston will stretch itself to the most extreme of its jounce and rebound zones. 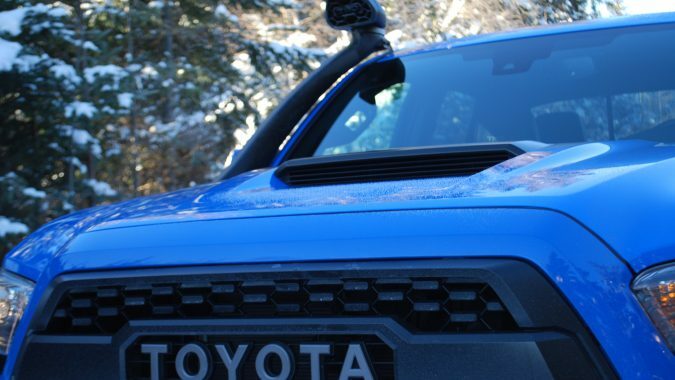 Head to work on the DVP, and the lightest damping rate near the center of its travel provides an acceptably smooth on-road ride, certainly better than the standard Tacoma shocks and light years ahead of the old Bilstein units. A downside to the Fox design compared to the costly Multimatic spool-valve units on the Colorado ZR2 is that they are position-dependent. This means lifting the truck with aftermarket kits without replacing the shocks will likely alter the truck’s driving dynamics … and not in a good way. Budget for that if you plan to turn this thing into a brodozer. Not that the truck isn’t already well on its way to being owned by the Chads and Bretts and Codys of the world. 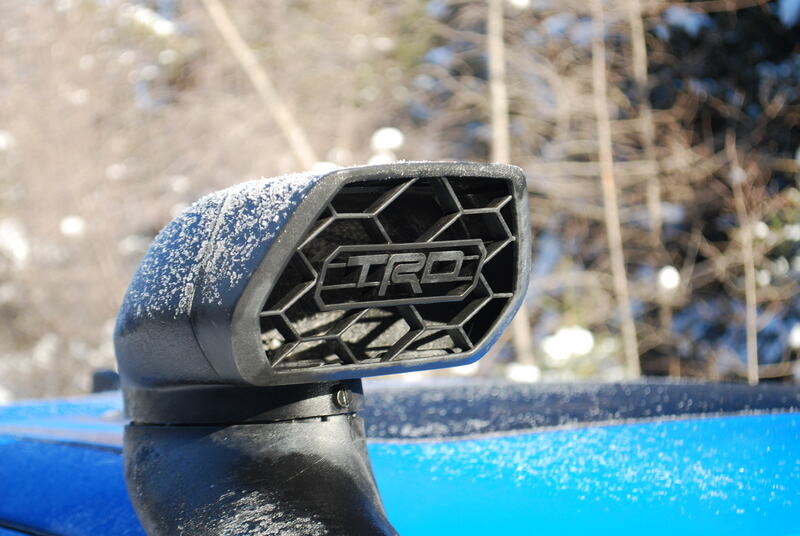 It’s easy to spot a TRD Pro, as its Desert Air intake stands tall like an errant nail waiting to be hammered in place. That black snake moaning is a functional unit that keeps the engine breathing cleaner, less dusty air from above the windshield. Since it is a factory installed piece, the new hole in the right-side fender is treated with the same rust protection as the rest of the truck. This beats having a teenager in your dealer’s washbay hacking into your new truck with a Sawzall as might happen if this were a dealer installed accessory. The intake ingests large gulps of fresh atmosphere but is emphatically not for deep-water diving, nor does it add to the power output of the truck’s 3.5L V6. A pair of thumbwheels allow the intake’s head to be swivelled around, a procedure Toyota recommends if you’re driving into a snowstorm. The head is also tethered in case it gets knocked off by debris or something. Is the snorkel-style intake necessary? Do most owners of a Canada Goose parka wear them in the weather for which they are rated? The answer to both those questions is no, of course, and the reason both are purchased is similar: their buyers like the style. Few purpose-specific machines ever spend the majority of their time in their intended environment – a Range Rover spends most of its time at Costco after all, likely being driven by someone wearing a Canada Goose parka. 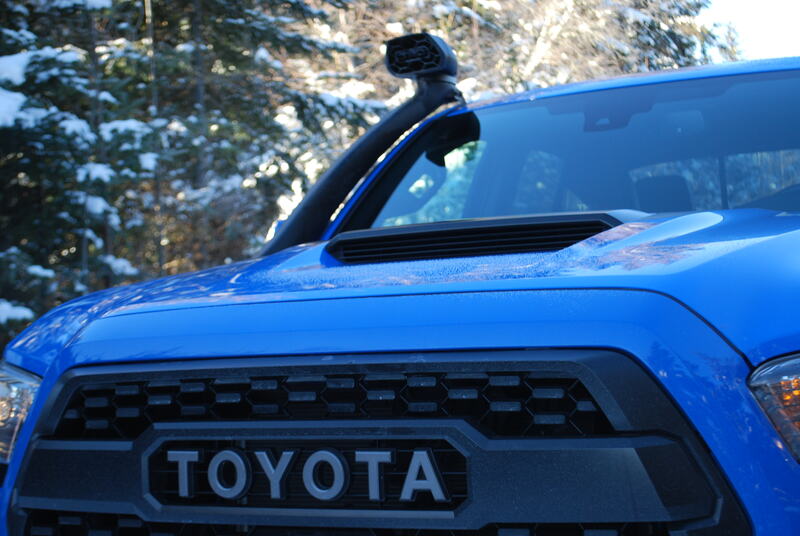 The Tacoma’s interior can be generously described as snug, with your 6’6” author regularly introducing his rapidly balding pate to the roof during off-road maneuvers and highway driving alike. This is a function of the Tacoma’s already tight interior measurements being further hampered by the presence of a sunroof. Toyota’s pencil-necked, bedwetting lawyers must’ve won some sort of bet to see just how many warning stickers they could fasten to the TRD Pro. From the driver’s seat, no fewer than eight bright-yellow admonishments are visible, warning of everything from impending doom if the locking rear differential is improperly engaged to the truck’s exaggerated centre of gravity. More stickers reside in the bed and underhood. I’m surprised there’s not one telling drivers to wash their hands before eating. A scraper and a bottle of Goo-Gone would be my first purchases after signing the note on a TRD Pro. Barring all that nonsense, this is a great-looking truck. 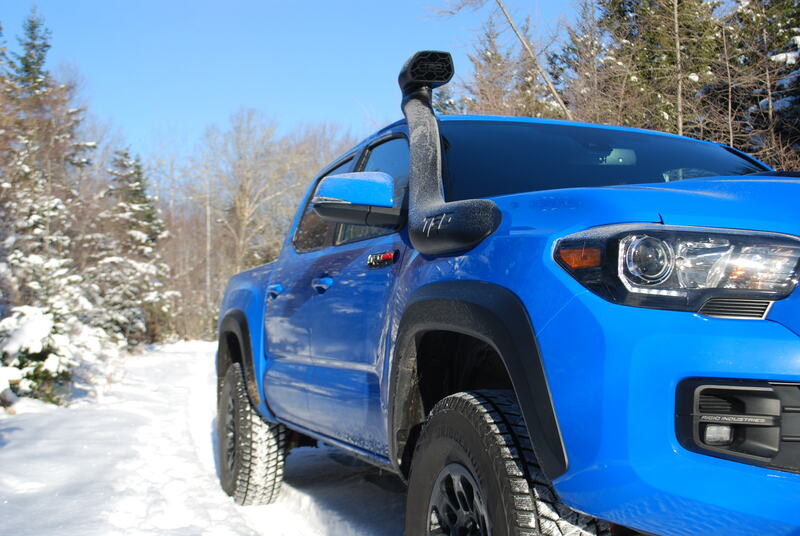 Shown here in extroverted Voodoo Blue, the Pro adds that dandy new grille bearing a TOYOTA billboard, plus natty 16-inch TRD Pro wheels which add an inch of track width front and rear. 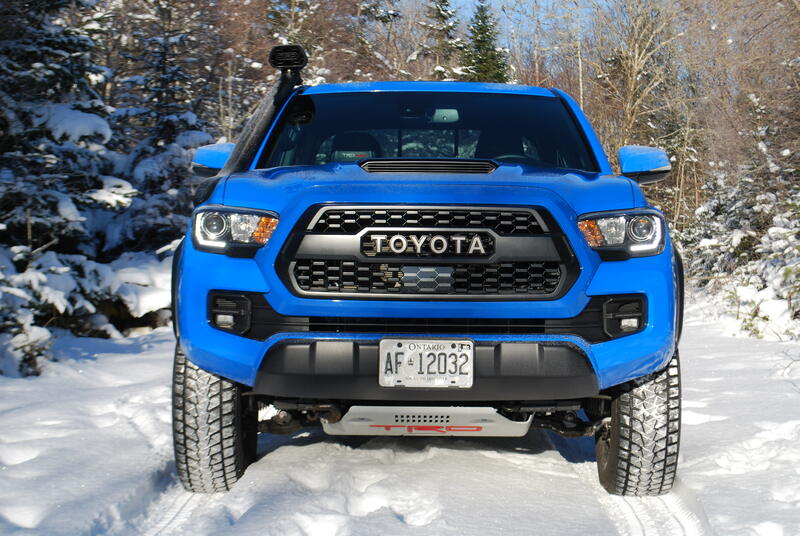 LED foglamps bearing the Rigid Industries brand illuminate after-hours adventure and a front skidplate measuring a quarter-inch thick bears a red TRD badge and is allegedly strong enough to support a jack when hoisting the truck aloft. 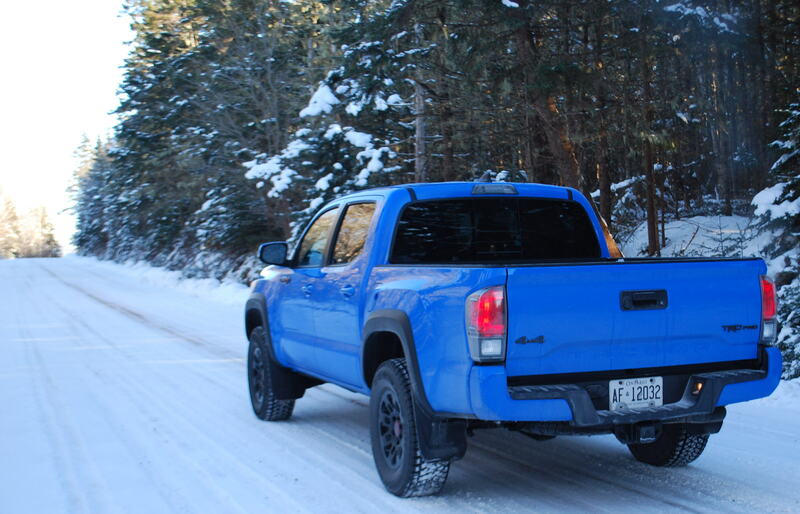 Wheeling the Pro into the snowy Atlantic Canadian wilderness revealed a truck that’ll handle the off-road tasks asked of it by any sane driver. Controls knobs and switches for its driver selectable off-road modes and variable crawl speeds are located in an overhead console, allowing wannabe pilots to act out all their Top Gun fantasies. Toyota’s lawyers must have attended meetings about the 4×4 system’s shifting action, too, as anything less than the precise and complicated dance of button-pressing and knob-twirling lands the driver with a whole lotta ‘nope’ when trying to shift out of 4-Low and disengage the rear locker. Back on pavement, long highways slogs are undertaken by the six-speed automatic transmission in mostly fifth and even fourth gear unless the macadam is billiard table flat or canted downhill. Cruising at 115 km/h sends engine speed to well over 3000rpm in fourth, while more sensible 105 km/h will keep revs in the 2k range even after a downshift to fifth but such a speed will quickly get you run over on the Don Valley Parkway during the morning rush. This behaviour hurts fuel economy. 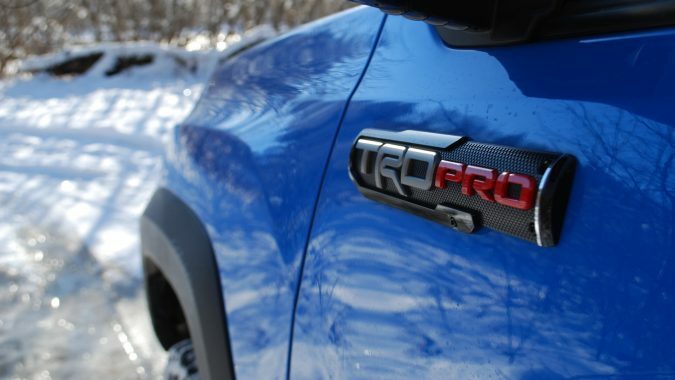 Covering 355km during its stay, 2/3 of which were run at a constant highway speed with the remaining distance made up of off-road hoonery, the TRD Pro guzzled 51L of gasoline, returning an observed fuel economy of 14.3L/100km. Like whiskey and steaks, then, you gotta pay for the good stuff. 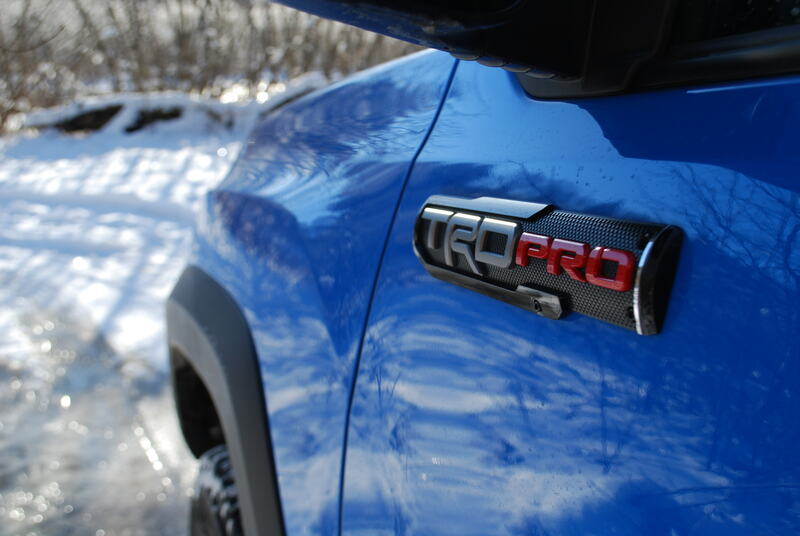 Building a 2019 Toyota Tacoma TRD Pro requires one to start with a 4×4 Double Cab V6 Short Box pickup, a $42,940 machine onto which the $13,495 TRD Pro package must be layered, bringing the pricetag to an alarming $56,435. A version of the same but with a six-speed manual transmission poking out of the floor can be had for $52,870. Across town, a comparable 2019 Chevrolet Colorado ZR2 Crew Cab is stickered at $47,200. Jeep’s Gladiator has not yet been given a price. There’s no doubting this truck’s ability, especially with its new suspension goodies and an approach angle that outstrips the ZR2. It will satisfy diehard Toyota truck enthusiasts by dint of being many leagues more capable than the old TRD Pro and possessing a sky-high resale value. Everyone else should look closely at the sticker price and shop around before making a final decision. 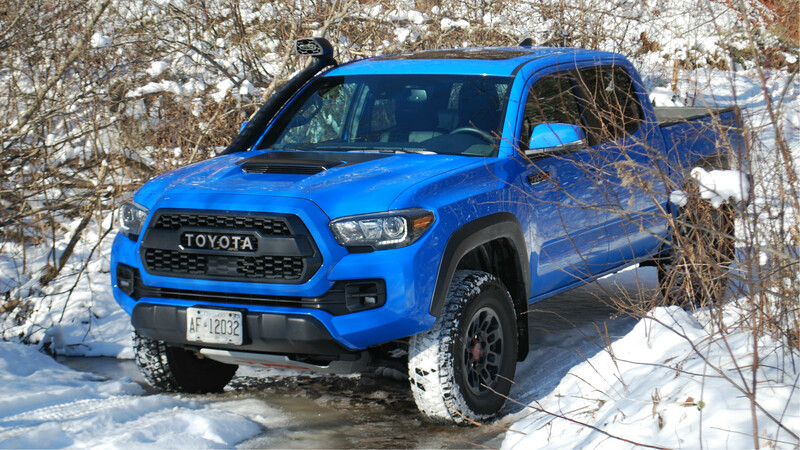 One thing’s for sure – these changes for the 2019 model year mean the Tacoma TRD Pro can now truly keep company with the mid-size off-road brodozers from Detroit.